IN THE MARKET FOR A NEW SIGN? Signage plays a big role in the success of your business. They help you say, “Look at me, I am here.” Signage acts as a reminder to customers, reminding them of their need that your business can satisfy, thereby pulling them in. In fact, 76% of consumers say they have entered a store they have never visited before based on its sign! 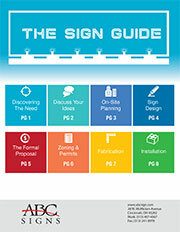 If you’re in the market for a new sign, it’s time to download our FREE guide! Fill out our quick & easy form to download your FREE Ebook immediately!